Whatever remains in its way, the Losi® PERSISTENCE® SCT Short Course Truck can go through it. Taking numerous style hints from Group Losi Racing®, this SCT is constructed on the original 10 platform-known around the world as one of the most difficult platforms around. The PERSISTENCE SCT includes a full metric hardware plan and was style to be tough and tunable thanks to its race-engineered composite chassis. The bottom packing battery makes it easy for quick battery modifications and the entire water resistant power system utilizes Dynamite® 60A ESC and a 12T brushed motor for speeds of 25+ Miles Per Hour right out of package. Chauffeurs stay in control with a Spektrum™ STX2® with a Spektrum Receiver and scale to size Maxxis Razr MT tires. Finally, the PERSISTENCE® SCT features an upgraded body with your option of either Method Wheels or Fox Racing Shocks graphics to stand out any place it goes. You get all this and more from the brand name that represents the pinnacle of performance. The famous, high-performance 10 platform features a super-tough composite chassis and the ability to adjust the vehicle suspension and drivetrain for any condition. The front and rear suspension provide fantastic handling with a consistent feel and the ability to absorb bumps. All of it amounts to a truck that’s called in for maximized efficiency right out of package. Full-time four-wheel drive provides increased traction and handling. The front, center and rear differentials can likewise be tuned for numerous conditions. Included with the PERSISTENCE SCT is a center differential that permits the power to bleed to the front or rear and permits the vehicle to manage the roughest terrain. Adjustable oil filled coil-over shocks on all four corners absorb the gnarliest terrain. The 12mm shocks are fully-adjustable and permit you to tune the handling of the PERSISTENCE SCT to maximize efficiency and control anywhere. The super-tough composite chassis lets you rapidly and easily make battery modifications without removing the body. All parts are water resistant, so you can run the vehicle in the nastiest conditions you can possibly imagine. *For details on water resistant standards, please refer to the product user's manual. Complete metric hardware is included throughout the PERSISTENCE SCT, including bearings, screws and nuts. These shock absorbers assist keep the PERSISTENCE extremely steady therefore you can maintain control on even the most difficult terrain. A race influenced scale short course body with interesting Method Wheels or Fox Racing Shocks graphics used in 2 different color variations. 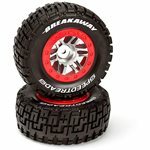 Interacting with MAXXIS Tires, Losi added scaled-down Razr MT tires with an aggressive tread pattern that will assist you take on any terrain. Whether you're driving on asphalt or dirt, these tough tires provide long-lasting tread life and first-rate efficiency. Dynamite 60A Brushed ESC and 12T 550 Brushed Motor will provide terrific power with a 2 cell Lipo (not consisted of). The ESC is water resistant and comes pre-wired with a high-current EC3 port. The ESC is 2S Li-Po and Ni-MH suitable. Reliable Spektrum 2.4 GHz radio with terrific range and lots of changes. Waterproof SRX200 receiver likewise consisted of.